Click the button below to add the Q-FORMS Kick Panel Speaker Mounts by Q-Logic FREE SHIPPING! to your wish list. Q-Forms are replacement kick panels that have molded in speaker mounting locations to house the high quality speaker system of your choice. Each Q-Forms panel is custom designed to be a direct replacement for the factory panel in your car, truck, or SUV. They are available in every factory color originally offered for your vehicle, as well as black. Q-Forms are sold in Pairs. Even though these are CUSTOM items, most kick panel orders are in transit to you within 2 days! Note: The Q-Forms do not come with pre-cut holes, so you must cut holes in order to install your component speakers in the enclosures. 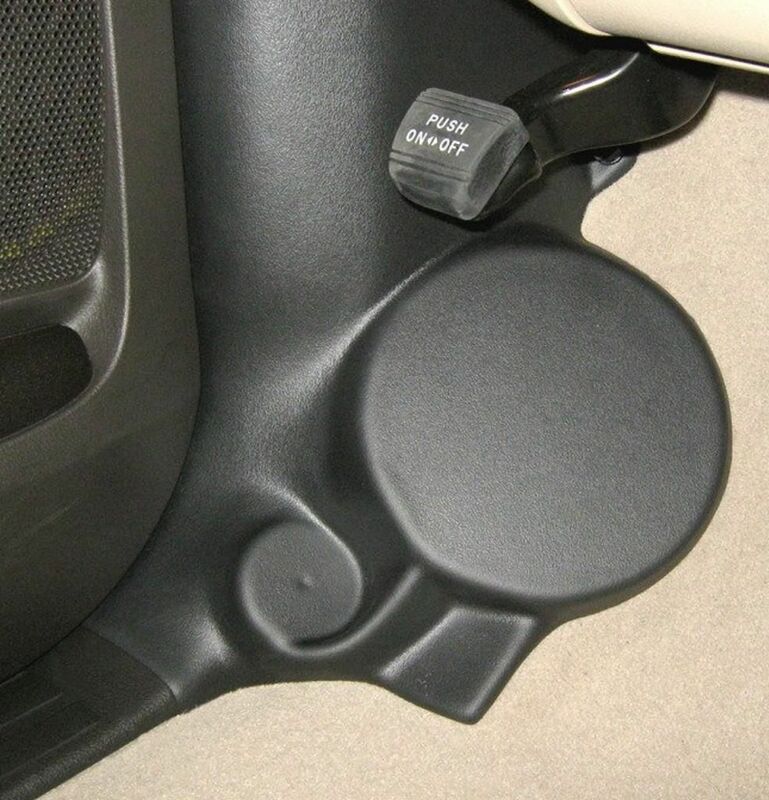 Installing the Q-Forms panel enclosures in your vehicle may require relocation of the parking brake pedal or other vehicle parts. Already have a Q-Logic Enclosure and Subwoofer system? The next step is to upgrade your speakers. But first, we need to clarify one thing. Stock speaker locations are not the ideal. In most vehicles, the speakers are mounted in the doors and fire directly into your leg. Here’s something to think about. Whether it’s a Home or Car Audio store, when you go to listen to any speakers, they are always aimed directly at you. You are “On Axis” with the speakers. Speakers are engineered to Sound and Perform Best, when you are On Axis. Once they are installed in the doors of your vehicle, you are now “Off Axis,” because the speakers are no longer aimed directly at you. Therefore, the ONLY time you get to hear your speakers, as they were designed and engineered to sound, was at the Store when you bought them. Does that sound right? Not at all! The idea of locating speakers in the kick panel area dates back to the hey-days of organized sound-off competitions. The best way to understand why competitors began to locate speakers in the kick panel areas is to consider the difference between listening to music in your vehicle versus listening from the comfort of your sofa. In the drivers’ seat of a vehicle, you are to the far left of a pair of stereo speakers mounted in the doors or the dashboard of the vehicle. Contrast this to sitting in the “sweet spot” on your sofa, equidistant between a pair of properly toed-in stereo speakers! Obviously, your sofa offers a more ideal listening position. This central position allows the sound from each speaker to arrive at the listener’s ears at the exact same time. A really good pair of properly set up home audio speakers will allow one to hear the vocals and instruments exactly as the recording engineer intended, as well as their locations within the soundstage – both left and right and from front to rear. In some cases, the speakers can seem to disappear, giving one the impression of being there! The term to describe proper localization of instruments and vocals within the soundstage is called “imaging” – and this is one of the most difficult things to achieve in an automobile. No Grilles: No grilles are included with the Q-Forms C-SERIES, you must use the grilles supplied with the component system. In some cases, the grille could slightly overlap the mounting surface for the woofer. In this case the cutout can be made so any overlap occurs at the back bottom edge where it will not be visible. Q-Logic UNIVERSAL Kick Panel Speaker Mounts Forms/Pods FREE SHIPPING! Q-FORMS GM Classic Cars 1968-1972 Kick Panel Speaker Mounts by Q-Logic FREE SHIPPING!